You are here: Home / Money / Business / Donald Trump’s accomplishments make Barack Obama look even worse. 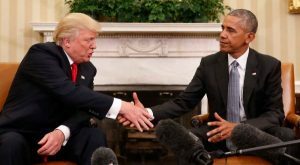 Donald Trump’s accomplishments make Barack Obama look even worse. (ThyBlackMan.com) In the 2012 presidential election, I recall a close friend who is a successful businessman in his own right, telling me the reason we had to support Mitt Romney was because he was a successful businessman. My friend insisted that we needed a businessman as president if we were to see the economy turn around. I agreed with my friend’s assessment, but I disagreed with his belief that Romney was that businessman. The difference between Obama and Romney can be reduced to Obama’s alleged immoral behavior in the seamy underbelly of Chicago’s bathhouses. President Trump, however, is a different story. As I’ve said before, President Trump is a blue-collar billionaire who actually built his global business empire. He didn’t inherit it; he worked for it, many times risking everything for success in one area. He is a master at bringing projects home ahead of schedule and under budget. What has Obama ever accomplished or built? We are told that Bill Ayers – the radical communist and anarchist whose wife spent time on the FBI’s Ten Most Wanted List – ghostwrote Obama’s book(s). Pitiful misguided souls are calling President Trump a racist and claiming he’s the worst president in history. But when challenged to present facts to support their claims, they’re unable. The late Daniel Patrick Moynihan said: “Everyone is entitled to his own opinion, but not his own facts.” The facts cannot be denied; Obama was a disaster as president. Barack Obama didn’t build anything or run anything before taking office. He was a community organizer, which is tantamount to being a “mobster.” Community organizers promise they won’t destroy your property or stir up disturbances in exchange for a company or property owner succumbing to their extortion threats. It can be argued that the only promise Barack Obama kept was that he would “fundamentally change America” – and that he did. It is not ipse dixit to say his health-care program was an unmitigated disaster. His international dealings were pleasing to the Muslim Brotherhood, Iran and other terrorist Muslim groups, but they weren’t favorable to Israel or to America. Was forcing public facilities and schools to allow men to use women’s bathrooms an accomplishment? He stirred the caldron of skin-color discord on a level not witnessed since white Democrats started the Ku Klux Klan. Thankfully, President Trump is doing exactly what he promised to do, and he is doing it virtually singlehandedly. A key accomplishment is that great numbers of people are going back to work. The economy has shown a massive turnaround; unemployment is at 3.8 percent; the stock market is at an all-time high. President Trump, in a way reminiscent of President Reagan, has shown our enemies that America is not their doormat nor will America be bullied by them. In his first State of Union Address, President Trump did something unheard of in the last decades; he did not promise to send billions of taxpayer dollars to other countries. Being a successful businessman, the president understands the importance of sound decision-making practices. He understands that every decision made must be based upon what is best for the business, both short term and long term. He has displayed the same approach as president. It is the height of irrational reasoning born out of inculcated hatred when we witness young black people who have no reference points pursuant to successful business practices attack President Trump as racist. They are foolish accusations from the mouths of those suffering from what amounts to a perverse form of intrauterine torsion that reduces oxygen to the brain. It is clear to all who are honest that Obama accomplished next to nothing for the good of America as a whole, and the facts support my assertion. President Trump has put America back to work – and if that were his only accomplishment, it would worthy of praise. Because of the continued stock market performance, people are blessed to have a few years of market growth that will help replenish their retirement portfolios. Being a color isn’t a skill set, and having a wife who could do jumping jacks didn’t impress China or North Korea. Obama cannot be lauded as great simply because of his melanin content and ghettoish behavior that blacks found acceptable. He must be examined under the microscope of what was/is best for the American people. When examinations are performed using that method of testing we must go back to Ronald Reagan to find another resident who has done as much for the American people. Ignorance and skin-color bias is not an intellectual pursuit. I challenge those who are saying President Trump is a racist and that he’s not doing what is best for America to give us facts that support those accusations. Opinions are not facts. Watch the Netflix program “Dirty Money”, episode 6 to see what a con man Trump is and always has been. Trump is not a self-made man. He was always part of the 1% in the U.S.! Everybody can see on this link https://en.wikipedia.org/wiki/Fred_Trump Trump’s father net worth. Trump is not a self-made man. He was always part of the 1% in the U.S.! Everybody can see on this link Trump’s father net worth.